Gingivitis is a non-destructive disease that causes inflammation of the gums. The most common form of gingivitis, and the most common form of periodontal disease overall, is in response to bacterial biofilms (also called plaque) that is attached to tooth surfaces, termed plaque-induced gingivitis. Most forms of gingivitis are plaque-induced. Additionally, the stippling that normally exists in the gum tissue of some individuals will often disappear and the gums may appear shiny when the gum tissue becomes swollen and stretched over the inflamed underlying connective tissue. The accumulation may also emit an unpleasant odor. When the gingiva are swollen, the epithelial lining of the gingival crevice becomes ulcerated and the gums will bleed more easily with even gentle brushing, and especially when flossing. A new study from 2018 found compelling evidence that gingivitis bacteria may be linked to Alzheimer's disease. Scientists agree that more research is needed to prove a cause and effect link. . "Studies have also found this bacteria, P. gingivalis – which is responsible for many forms of gum disease – can migrate from the mouth to the brain in mice. And on entry to the brain, P. gingivalis can reproduce all of the characteristic features of Alzheimer’s disease." Because plaque-induced gingivitis is by far the most common form of gingival diseases, the following sections will deal primarily with this condition. The cause of plaque-induced gingivitis is bacterial plaque, which acts to initiate the body's host response. This, in turn, can lead to destruction of the gingival tissues, which may progress to destruction of the periodontal attachment apparatus. The plaque accumulates in the small gaps between teeth, in the gingival grooves and in areas known as plaque traps: locations that serve to accumulate and maintain plaque. Examples of plaque traps include bulky and overhanging restorative margins, clasps of removable partial dentures and calculus (tartar) that forms on teeth. Although these accumulations may be tiny, the bacteria in them produce chemicals, such as degradative enzymes, and toxins, such as lipopolysaccharide (LPS, otherwise known as endotoxin) or lipoteichoic acid (LTA), that promote an inflammatory response in the gum tissue. This inflammation can cause an enlargement of the gingiva and subsequent formation. Early plaque in health consists of a relatively simple bacterial community dominated by Gram-positive cocci and rods. As plaque matures and gingivitis develops, the communities become increasingly complex with higher proportions of Gram-negative rods, fusiforms, filaments, spirilla and spirochetes. Later experimental gingivitis studies, using culture, provided more information regarding the specific bacterial species present in plaque. Taxa associated with gingivitis included Fusobacterium nucleatum subspecies polymorphum, Lachnospiraceae [G-2] species HOT100, Lautropia species HOTA94, and Prevotella oulorum (a species of Prevotella bacterium), whilst Rothia dentocariosa was associated with periodontal health. Further study of these taxa is warranted and may lead to new therapeutic approaches to prevent periodontal disease. Gingivitis is a category of periodontal disease in which there is no loss of bone but inflammation and bleeding are present. Each tooth is divided into four gingival units (mesial, distal, buccal, and lingual) and given a score from 0-3 based on the gingival index. The four scores are then averaged to give each tooth a single score. The diagnosis of the periodontal disease gingivitis is done by a dentist. The diagnosis is based on clinical assessment data acquired during a comprehensive periodontal exam. Either a registered dental hygienist or a dentist may perform the comprehensive periodontal exam but the data interpretation and diagnosis are done by the dentist. The comprehensive periodontal exam consists of a visual exam, a series of radiographs, probing of the gingiva, determining the extent of current or past damage to the periodontium and a comprehensive review of the medical and dental histories. 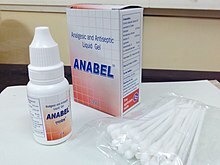 Current research shows that activity levels of the following enzymes in saliva samples are associated with periodontal destruction: aspartate aminotransferase (AST), alanine aminotransferase (ALT), gamma glutamyl transferase (GGT), alkaline phosphatase (ALP), and acid phosphatase (ACP). Therefore, these enzyme biomarkers may be used to aid in the diagnosis and treatment of gingivitis and periodontitis. Gingivitis can be prevented through regular oral hygiene that includes daily brushing and flossing. Hydrogen peroxide, saline, alcohol or chlorhexidine mouth washes may also be employed. In a 2004 clinical study, the beneficial effect of hydrogen peroxide on gingivitis has been highlighted. The use of oscillation type brushes might reduce the risk of gingivitis compared to manual brushing. 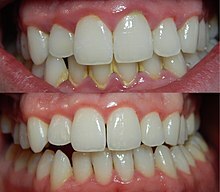 Rigorous plaque control programs along with periodontal scaling and curettage also have proved to be helpful, although according to the American Dental Association, periodontal scaling and root planing are considered as a treatment for periodontal disease, not as a preventive treatment for periodontal disease. In a 1997 review of effectiveness data, the U.S. Food and Drug Administration (FDA) found clear evidence showing that toothpaste containing triclosan was effective in preventing gingivitis. The focus of treatment is to remove plaque. Therapy is aimed at the reduction of oral bacteria and may take the form of regular periodic visits to a dental professional together with adequate oral hygiene home care. Thus, several of the methods used in the prevention of gingivitis can also be used for the treatment of manifest gingivitis, such as scaling, root planing, curettage, mouth washes containing chlorhexidine or hydrogen peroxide, and flossing. Interdental brushes also help remove any causative agents. The active ingredients that "reduce plaque and demonstrate effective reduction of gingival inflammation over a period of time" are triclosan, chlorhexidine digluconate, and a combination of thymol, menthol, eucalyptol, and methyl salicylate. These ingredients are found in toothpaste and mouthwash. Hydrogen peroxide was long considered a suitable over-the-counter agent to treat gingivitis. There has been evidence to show the positive effect on controlling gingivitis in short-term use. A study indicates the fluoridated hydrogen peroxide-based mouth rinse can remove teeth stain and reduce gingivitis. Based on a limited evidence, mouthwashes with essential oils may also be useful, as they contain ingredients with anti-inflammatory properties, such as thymol, menthol and eucalyptol. The bacteria that causes gingivitis can be controlled by using an oral irrigator daily with a mouthwash containing an antibiotic. Either amoxicillin, cephalexin, or minocycline in 16 ounces of a non-alcoholic fluoride mouthwash is an effective mixture. Overall, intensive oral hygiene care has been shown to improve gingival health in individuals with well-controlled type 2 diabetes. Periodontal destruction is also slowed down due to the extensive oral care. Intensive oral hygiene care (oral health education plus supra-gingival scaling) without any periodontal therapy improves gingival health, and may prevent progression of gingivitis in well-controlled diabetes. "Full width gingivitis" of orofacial granulomatosis. ^ The American Academy of Periodontology. Proceedings of the World Workshop in Clinical Periodontics. Chicago:The American Academy of Periodontology; 1989:I/23-I/24. ^ Ammons, WF; Schectman, LR; Page, RC (1972). "Host tissue response in chronic periodontal disease. 1. The normal periodontium and clinical manifestations of dental and periodontal disease in the marmoset". Journal of Periodontal Research. 7 (2): 131–43. doi:10.1111/j.1600-0765.1972.tb00638.x. PMID 4272039. ^ Page, RC; Schroeder, HE (1976). "Pathogenesis of inflammatory periodontal disease. A summary of current work". Laboratory Investigation. 34 (3): 235–49. PMID 765622. ^ "Parameter on Plaque-Induced Gingivitis". Journal of Periodontology. 71 (5 Suppl): 851–2. 2000. doi:10.1902/jop.2000.71.5-S.851. PMID 10875689. ^ Saini, Rajiv; Saini, Santosh; Saini, Sugandha R. (2010-01-01). "Periodontitis: A risk for delivery of premature labor and low-birth-weight infants". Journal of Natural Science, Biology, and Medicine. 1 (1): 40–42. doi:10.4103/0976-9668.71672. ISSN 0976-9668. PMC 3217279. PMID 22096335. ^ "Alzheimer's is linked to gum disease – but bad oral health is not the only culprit". ^ Research, Science and Therapy Committee of the American Academy of Periodontology (2001). 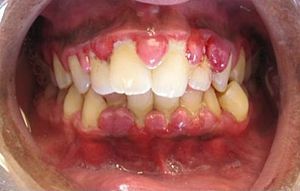 "Treatment of Plaque-Induced Gingivitis, Chronic Periodontitis, and Other Clinical Conditions". Journal of Periodontology. 72 (12): 1790–1800. doi:10.1902/jop.2001.72.12.1790. PMID 11811516. ^ Kistler, James O.; Booth, Veronica; Bradshaw, David J.; Wade, William G.; Glogauer, Michael (14 August 2013). "Bacterial Community Development in Experimental Gingivitis". PLoS ONE. 8 (8): e71227. Bibcode:2013PLoSO...871227K. doi:10.1371/journal.pone.0071227. PMC 3743832. PMID 23967169. ^ Armitage, Gary C. (1999). "Development of a Classification System for Periodontal Diseases and Conditions" (PDF). Annals of Periodontology. 4 (1): 1–6. doi:10.1902/annals.1999.4.1.1. PMID 10863370. Archived from the original (PDF) on 2010-06-12. ^ Sambunjak, D.; Nickerson, J. W.; Poklepovic, T.; Johnson, T. M.; Imai, P.; Tugwell, P.; Worthington, H. V. (2011). Johnson, Trevor M (ed.). "Flossing for the management of periodontal diseases and dental caries in adults". The Cochrane Library (12): CD008829. doi:10.1002/14651858.CD008829.pub2. PMID 22161438. ^ a b Hasturk, Hatice; Nunn, Martha; Warbington, Martha; Van Dyke, Thomas E. (2004). "Efficacy of a Fluoridated Hydrogen Peroxide-Based Mouthrinse for the Treatment of Gingivitis: A Randomized Clinical Trial". Journal of Periodontology. 75 (1): 57–65. doi:10.1902/jop.2004.75.1.57. PMID 15025217. ^ Yaacob, M; Worthington, HV; Deacon, SA; Deery, C; Walmsley, AD; Robinson, PG; Glenny, AM (17 June 2014). "Powered versus manual toothbrushing for oral health". The Cochrane Database of Systematic Reviews. 6 (6): CD002281. doi:10.1002/14651858.CD002281.pub3. PMID 24934383. ^ Stoeken, Judith E.; Paraskevas, Spiros; Van Der Weijden, Godefridus A. (2007). "The Long-Term Effect of a Mouthrinse Containing Essential Oils on Dental Plaque and Gingivitis: A Systematic Review". Journal of Periodontology. 78 (7): 1218–28. doi:10.1902/jop.2007.060269. PMID 17608576.